You have until the end of the month to pop over to Quay Arts in Newport to catch the latest exhibition by James Jarvis and Ged Wells. If you’re a fan of skateboarding, PLANK is a must-see exhibition. 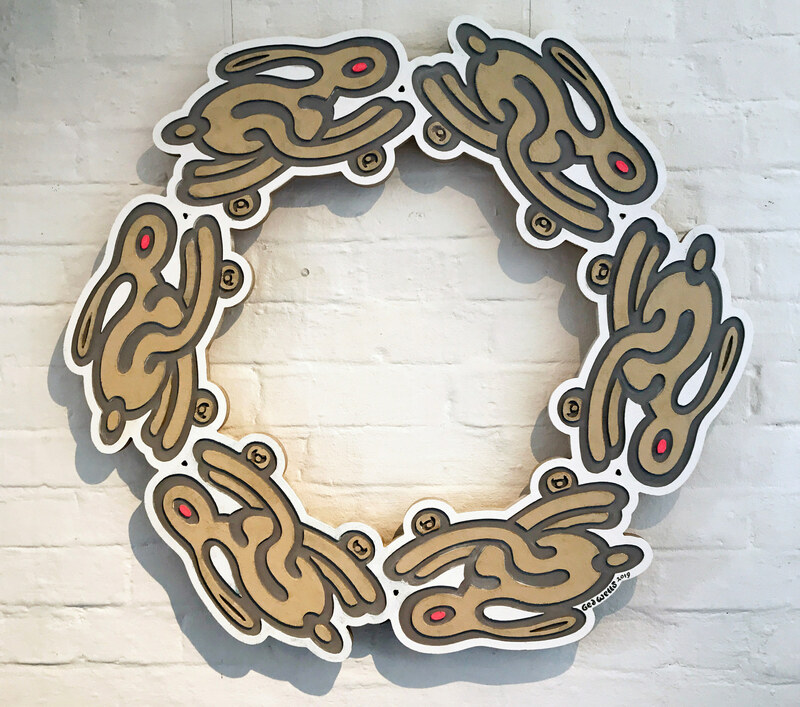 Last weekend we popped into Quay Arts in Newport to see one of the latest exhibitions and had a chance to chat with the artists, James Jarvis and Ged Wells. James and Ged have a shared obsession with skateboarding, having both worked for iconic London skateboard shop Slam City Skates in the late 80s and early 90s. They met recently for the first time, and have collaborated for this exhibition – PLANK, to explore and celebrate the object that has informed and defined both their early career paths, the skateboard. 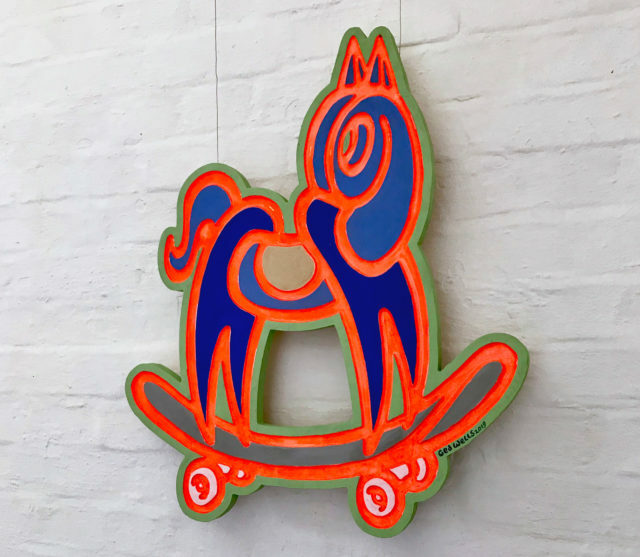 James presents artwork that reduces the skateboard to its essence as an object: a plank of wood, whilst Ged presents a series of zoomorphic, shapeshifting relief sculptures depicting malcontent skateboard graphics, evolved as purposeful planks, carved from an errant tree of life. Plank runs until Saturday 27th April 2019 at Quay Arts, Sea Street, Newport Harbour. The Gallery is open Mon – Sat, 10am – 5pm; Sundays 10am – 4pm. James Jarvis is an artist and visual philosopher whose practice encompasses cartoons, objects, graphic design, printmaking and moving image. His work concerns drawing, philosophy, alternate realities, minimalism and skateboarding. Jarvis was born in London in 1970 and studied at the University of Brighton and the Royal College of Art, graduating in 1995. His first commissioned work was for the influential London skate shop Slam City Skates. He has worked for clients worldwide, including Coca-Cola, Ikea, Nike and Uniqlo. In 1998, Jarvis designed the iconic character toy, Martin, for the cult fashion brand Silas. He enjoyed a long collaboration with Silas, which helped introduce him to a worldwide audience, notably in Japan. From 2003 to 2013, Jarvis worked on his own brand, Amos, in partnership with Silas’ co-director Russell Waterman. 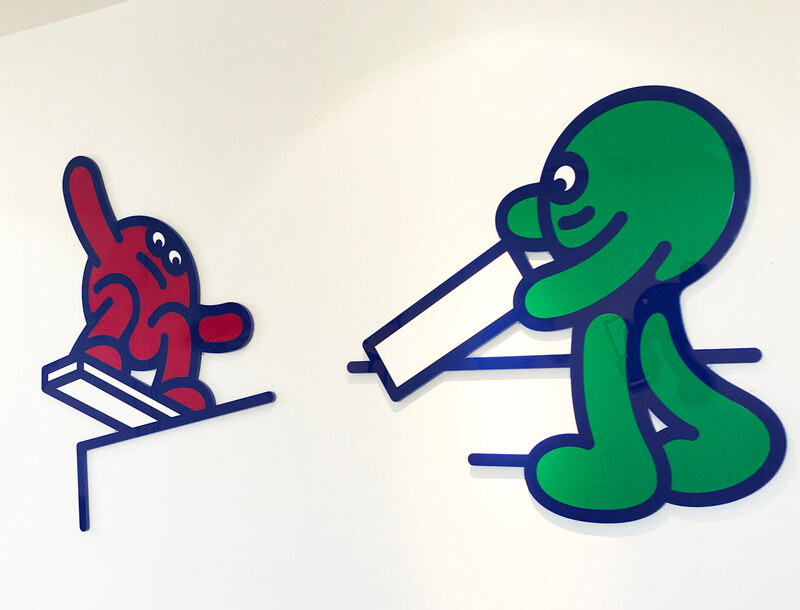 For Amos, Jarvis created more than 100 character toys, as well as graphics, comic strips, books, exhibitions, a music festival and a crazy-golf hole. More recently, Jarvis has concentrated on a simpler, reductive, drawing-based approach to his work. Jarvis lives with his partner and two children in south London. Find out more about James Jarvisvia his Website. Ged Wells, who grew up on the Isle of Wight, began channeling art through his Insane skateboard clothing brand while working as an archaeological illustrator in 1984. 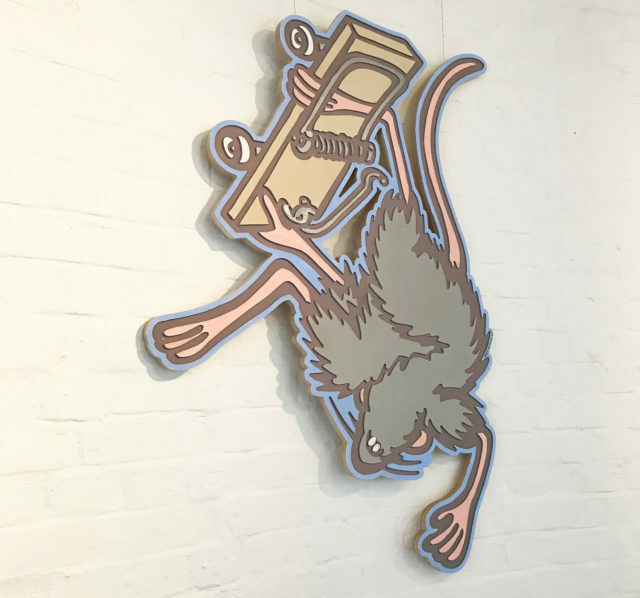 A key figure in 1980s Isle of Wight skateboarding culture, Wells then began competing internationally, at the same time creating art-filled skate zines, which led to a position as illustrator and features writer for R.A.D skateboard magazine. 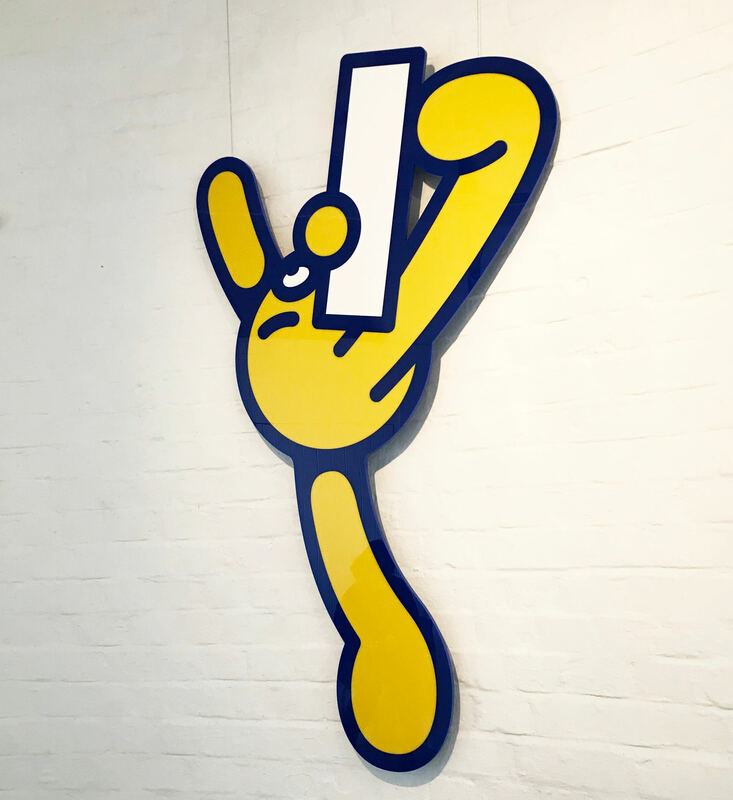 His art and Insane clothing brand grew in popularity at the start of the 90s after being discovered by Hiroshi Fujiwara in Japan and distributed by Slam City Skates in London. 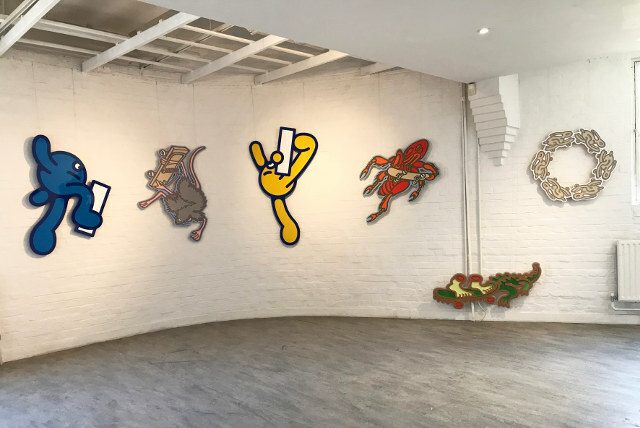 Exhibiting paintings, drawings, collage and character sculptures since the early 1990s, Wells works are laced with surreal narrative and anthropomorphic illusion, which are also woven into Insane product collections. An illustrator/creative, he has provided solutions for brands such as PlayStation, Mars and Louis Vuitton, as well as identity for independents such as Wiiija Records and The Idler magazine. One hundred of his illustrations can also be found in The Book of Idle Pleasures, published by Ebury Press. More recently he collaborated on two projects with Goodhood design store in Shoreditch – TSHIRTNOW/TSHIRTTHEN, an exhibition of past and current graphic t-shirts and the Art of Skateboarding exhibition in aid of the Save the Southbank campaign. He also exhibited paintings alongside classic Insane collections at Hiroshi Fujiwara’s Pool store in Tokyo. Wells solo shows include: Birds of Paradise at London’s Pure Evil gallery; Cats Lick Sinners at Cystem Gallery Tokyo; Nihilistic Puppets at Thunders store London; The Wild Strawberry Menagerie at The Cotswold Design Store; The Rambling Pachyder’macs and Plateau of Radiant Elephants at the Port Eliot Festival in Cornwall. Time and Relative Dimensions in Strawberry saw Wells transform a telephone kiosk in Llanfrynach, Wales into a diminutive strawberry gallery. Wells’ group shows include: Skullduggerous and Water Pots in aid of the Bhopal Medical appeal, a giant strawberry egg sculpture for The Lindt Big Egg Hunt in support of Action for Children and several of his sculptures formed part of the Fleurnication group show at The Modern Institute in Glasgow. Wells lives in East London and sells Insane and his art at Blackduke + Insane, 83, Grove Road, Walthamstow Village. Find out more about Ged Wells on via the Website.